JP Solutions' newest brand of products, Ecotex (launched in 2009), provides dental professionals with a variety of environmentally safe and clinically effective solutions. This dedication to both the safety of the environment and the needs of the dental professional is seen in the brand's Ecotex Disposable Prophy Angles. The ultra-strong unit construction of these disposable prophy angles helps to reduce vibrations. Aside from minimized vibration, the Ecotex Disposable Prophy Angles minimize splatter for a dentist- and patient-friendly experience. Individually wrapped and lubricated, the prophy angles also feature a latex-free webbed and ribbed cup, and the beveled gear design provides smooth, consistent operation. 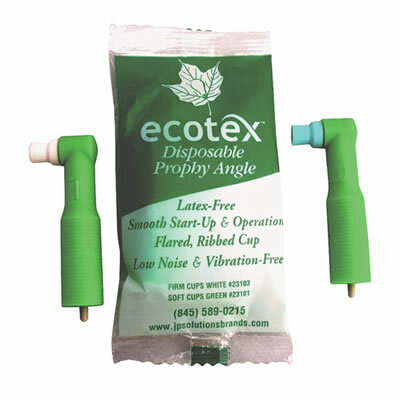 Ecotex Disposable Prophy Angles and their packaging were manufactured with both the clinician and the environment in mind. The packaging uses recycled materials and biodegradable inks in an effort to save trees and reduce landfill impact. The unique space-saver design reduces the use of packaging materials by about 40%, which, in turn, significantly reduces shipping costs and fuel used in transportation, according to the manufacturer.